A full-color cookbook containing more than 1,000 photographs and illustrations for a complete, step-by-step demonstration of each recipe. It includes more than 100 recipes - a fusion of the finest European and Asian pastries. This selection of cookies, pastries, breads, and much more is sure to capture the American audience with fresh and never before seen looks and tastes. 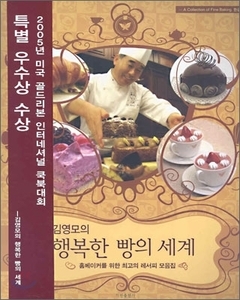 Young Mo Kim, president of the Korean Bakers Association, has published two best-selling baking books in South Korea. His passion for baking caused him to travel to perfect his art at internationally known culinary schools. His first bakery opened in Seoul, Korea in 1982. Currently, there are four Kim Young Mo Bakeries and a European-style cafe called Salon de Kim Young Mo. He teaches at several colleges in Korea, as well as conducting his own classes for at-home bakers, and is the star of various television baking shows in South Korea. Mr. Kim was selected as one of the judges for the 2004 and 2005 World Pastry Team Championship, and is a current judge of the Seoul International Bakery fair.